This past December, I published my work on understanding staff perceptions of constituent communication. That work was shortened into a post on the Leg Branch Capacity Working group website, and re-tweeted by my funders, the Democracy Fund. I’ve never been tweeted before ( I don’t even use a Twitter) but it feels great to see my voice get out there. Just this week, I officially completed a white paper that details the findings from my research I did this summer on the Hill. 1. The primary uses of policy-related constituent correspondence are to formulate outgoing communication and to monitor constituent sentiment. This finding is reflected in views of the staff and reinforced by the capabilities and limitations of the constituent correspondence technology. 2. 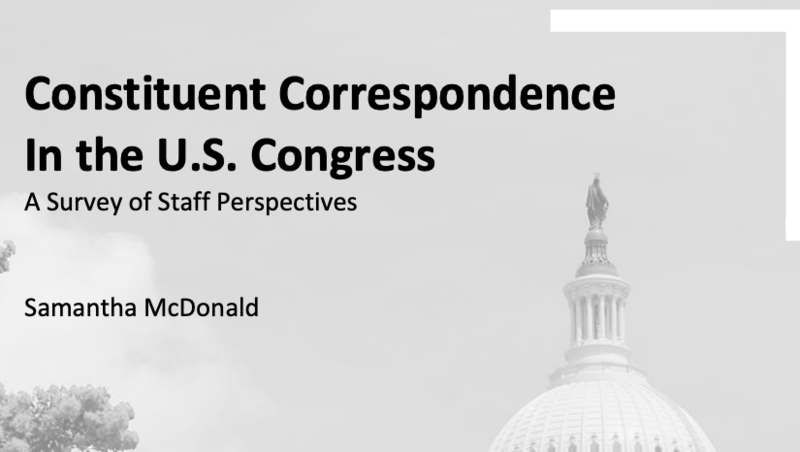 The current process for constituent correspondence does not promote policymaking that is responsive to constituent opinions. 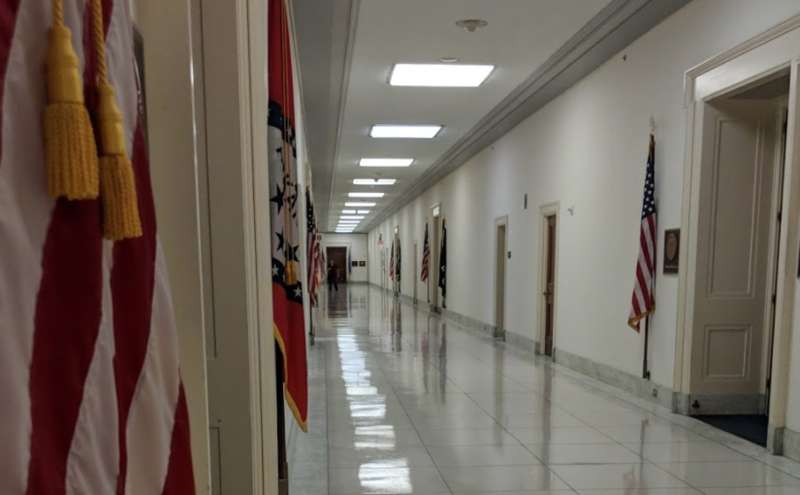 Staffers capture information during correspondence that logs minimal constituent opinion. It is shared with other staff by mail reports, which are shown in previous research to provide less useful information for responsive policymaking (Abernathy, 2015). Constituent opinion is also shared with other staff informally and upon the discretion of the correspondence staff. 3. Staffers report minimal policy value for advocacy related constituent input. 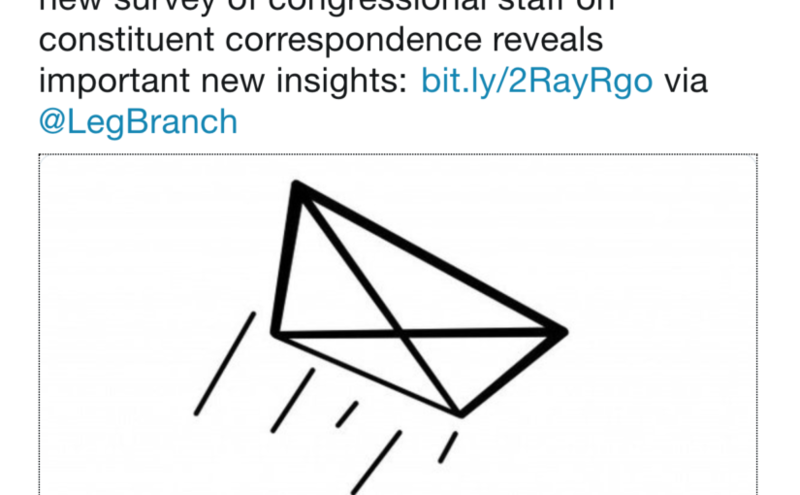 The vast majority of constituent correspondence via digital channels, like phone calls, emails, and faxes, is not deemed relevant for policy decision-making. Junior staff who answer incoming contact describe such correspondence as under- or misinformed, untimely, or unrelated to current policy concerns of the Member. They report this low-valued form of communication has expanded with the introduction of automatic and low-effort forms of advocacy technology. 4. There is a common perception that Members are constitutionally obligated to provide open channels for constituents to express their policy opinions. Although untrue, 68% of staff reported that Members must legally provide open channels for constituent communication. This perception could translate into an assumption that it is necessary for Members to maintain and have a presence on an ever-growing number of digital communication platforms. Over the past three weeks, I visited 100 offices in the House of Representatives to recruit legislative correspondents to take a survey. Not all offices participated, but I still stepped into every office and chatted with every person at the front desk. Below are all the things big and small that I learned and observed. Continue reading The Problem With Constituent Correspondence. Is Technology to Blame? Posted on July 31, 2018 August 13, 2018 Author samiamLeave a comment on The Problem With Constituent Correspondence. Is Technology to Blame? I have returned to Washington D.C. for the summer to continue my research on constituent communication technology in Congress. Since I’ve returned to listen to the stories of interns, LAs, Members, and other previous staffers, I’ve begun to value more qualitative methods in my research. During my comprehensive exam, I read numerous papers describing quantitative studies that try to track who, what, where, when, why and how representatives value constituent input into the policymaking process. What has been bugging me lately is the rhetoric around choice within this system. All too often I see too many assumptions about Representatives having a choice in how to vote, how to communicate with constituents, how to organize their office, and how to include citizens in the policymaking process. And often these constraints are based on quantitative methods and understandings of how Congress works. But these ‘choices’ are constrained by the organization, the culture, and the technology of Congress (see Jane Fountain’s work). The quantitative research I have seen uses rhetoric that positions Members as in control of what they and their office do, but this is incorrect. And ethnographic work is necessary to identify the contextual nuances of every office, every staffer, and every Member to understand how their practices are influenced by others in the institution (see arguments by Weeden, 2010). I am not claiming that Members have no control over how they perform constituent communication. But I am saying that there are so many influences from Congress that limit those choices. And understanding those limitations are critical if we really want to understand why certain processes and decisions are made to manage constituent communication. I recently passed my comprehensive exams (woohoo!). In my department, the exam consists of writing a substantial literature review, which usually has 50-150 pieces of literature, and an in-person presentation and discussion of the literature with a committee of three persons. On my committee, I had Bonnie Nardi, Melissa Mazmanian, and Matt Beckmann. I enjoyed having an anthropologist, an orgs theorist, and a political scientist all in one room. They provided very different but very insightful perspectives on my review and the future of my research. My literature review was a combination of works in political science, sociology, information and computer science, and HCI. It was hard to situate my research into just one field, and I did my best to try to scope my review of literature in each field that pertained to my work. I’ve read a few papers by Girish J Gulati and Christine B Williams at Bentley University. Their work on social media adoption and Congress is super helpful to my work and I’m seeing some interesting themes with Congress and trends within technology through their work. 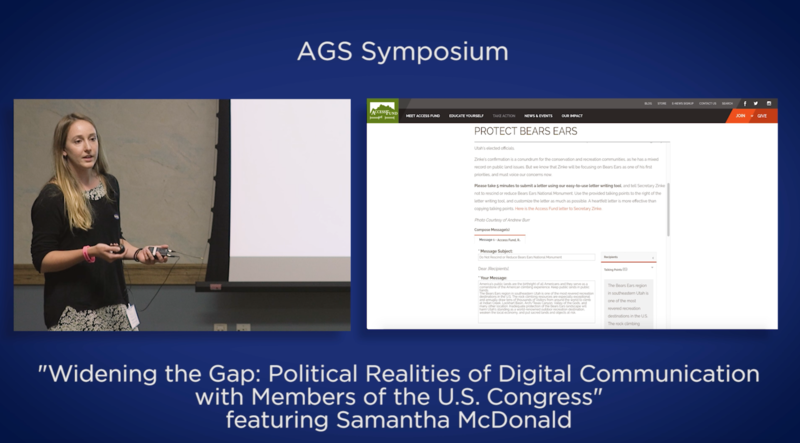 In this paper, Gulati and Williams look into the adoption of Facebook as a political platform in Congressional campaigns, with a diffusion of innovation lens. They find that there is no difference between Republicans and Democrats in their adoption. However there are certain trends in reasons for adoption that change each year. Last night I read: The democratic interface: technology, political organization, and diverging patterns of electoral representation by W. Lance Bennett, Alexandra Segerberg, and Curd B. Knüpfer. The piece was recently published in the journal of Information, Communication, and Society.